Hi friends! I've not been on the blog much last week but I have been sewing so I thought I'd catch you up on the latest! 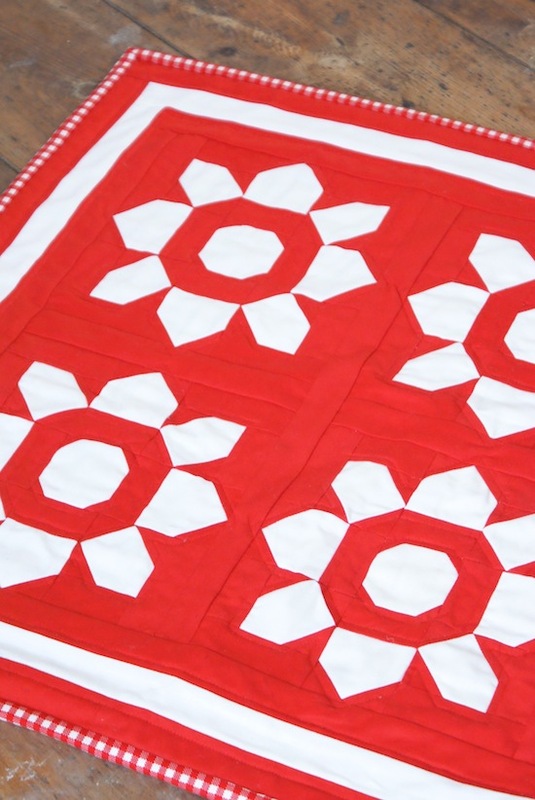 ;-) I decided another mini quilt was on the cards, (pictured below) the Mini Blossom by Fig Tree & Co was calling me after I'd seen Sherri's version from A Quilting Life. A classic red and white, using Kona solids Tomato and White and April Showers Red Gingham for binding, which frames it quite nicely I think. Having worked with solids for the mini quilt for a few days, and finishing a blue themed quilt top I had a major urge to sew something cute and fun with patterned fabrics, so I pulled out Lori's book 'Quilty Fun' of course! The tulip blocks were just the ticket, and the perfect excuse to use up some of the amazing new fabric collections we've got in recently at Sew and Quilt (I'll have to give you all an update of what we've been getting in recently!). I'm planning on a row of them and will piece them together for a wall hanging, as I have juuuust enough wall space left above my design wall in the sewing room! P.S. We have a little quilt-a-long going at the moment with the nautical quilt I'm making, Kerri and Tasha have joined me in making this fun quilt as well! You can follow all our progress on IG with #naturallynauticalquiltalong hashtag. Hope you can join in! hey, you are on fire ! i love those pretty tulips and the little red and white and the nautical, phew, like i said , on fire. 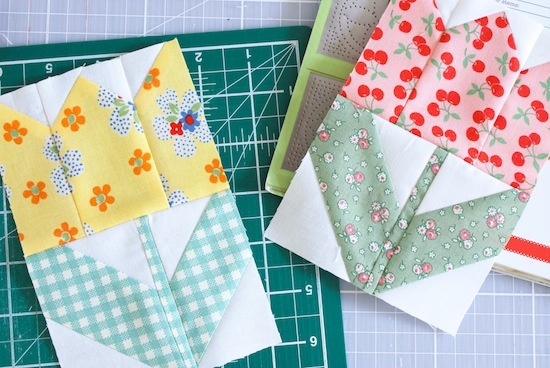 Love your blocks and mini Quilt. The Nautical blocks are my favorite. Yes, like you the quilting part for me always needs an EXTRA big shove, so in between I start other projects - then I have a 'few' items piling up to be quilted and finished. These are all so lovely... especially like the solid mini quilt which surprises me as I'm usually more of a ditsy print!